If you don't water, fertilize, and tend to your tomato each day, you are going to end up with a rotten tomato. 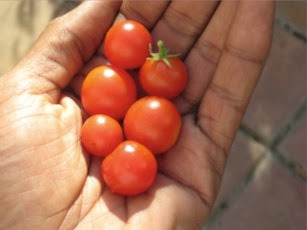 Did you ever grow some nice delicious tomatoes in your backyard? I tried it and I can say with confidence, I am not very good at backyard growing. However, what I did learn to do was become a become a very effective caregiver. Caregiving is a lot like farming. Let's face it, if you don't water, fertilize, and tend to your tomatoes every day they might likely die on the vine, or at best end up as puny little inedible tomatoes. Same things goes with caregiving. You have to water, fertilize, and tend to your patient each day if you want a delicious tomato. Join 17,644 other awesome readers who get new post alerts by email! It took me quite a while, a few years actually, to learn how to apply farming techniques to cargiving. I think most of you will agree my little tomato, Dotty, started looking better and better each year. The first two years the only thing I can say is I ended up with a rotten tomato. Then I started to get better at it. Around year four, I was becoming what can be described as a very good farmer. By year five, I was an award winner if I do say so myself. It won't take you anywhere near as long as it took me because I willing share my successes and failures right here on the Alzheimer's Reading Room. You always learn quicker by listening, and following the advice of someone that has more experience. The first thing you have to do to become a great farmer, and to grow delicious tomatoes, is establish a routine. Just like the farmer. As a caregiver you have to get the day started and running on a positive note. If you can start the day with a smile, you increase the odds of a successful day. The first part is easy. Get in front of your loved one, don't sneak up on them, and start with a nice smile, and a very positive sentence. Pee is the water of the excellent Alzheimer's caregiver. A pee every 90 minutes is an important part of the daily routine. Yeah, Yeah, I can hear some of you saying - he's dreaming if he thinks I can do that. Not to worry, Dotty said No to the pee pee for years. Believe it or not, it is easier to get a person living with Alzheimer's to pee every 90 minutes than it is to get them to pee every once in a while. Every once in a while when it is too late I might add. You should try and start the day the same way the patient did before AD. So in our case, I would get Dotty over to the kitchen table and sitting right next to a big window with bright light. Bright light is mood fertilizer by the way. Bright light every day if possible if you want a nice juicy delicious - tomato. Each day I would get Dotty to read to me from the front page of paper. If that didn't go well we would switch over to the food section, and I would get her to read me the recipe's. This is brain fertilizer. By they way, if the patient can't read, you do the reading. Gotta fertilize the tomato. I would then give Dotty some coffee. I figure Dotty drank coffee first thing every morning for about 70 years before I came to care for her, so I figured she would enjoy some coffee. Fertilize the existing patterns of behavior. Later in the game I added Harvey the repeat parrot. A lucky stroke of genius for sure. I thought he would make Dotty laugh he did. But he also became Dotty's best friend. Dotty loved Harvey and she told him so every day. Harvey was brain and mood fertilizer. Harvey by the way added much needed intraday respite care for me. I used him during the day to entertain Dotty. While he entertained her I could do anything I wanted to do, with the exception of going out, and Dotty wouldn't notice my absence for a while. After our third pee of the day, we would have music time. This was easy because we have about 80 music channels on our cable television. We used the swing channel because all of that music was pre 1950s and pre Elvis and rock and roll. Music is excellent fertilizer for the brain. But most importantly, it brings back memories. Ah, memories one of the most important parts of effective caregiving. You can actually have interesting conversations with a person who is deeply forgetful if you tap into their memories. Sometimes you might learn something you never knew. I did. And, quite often. In late afternoon, it was time to get Dotty showered and dressed. Don't laugh here, but, it is easier to get an AD patient to take a shower every day, or almost every day, then it is once in a while. All you have to do is learn how to use the hook. The hook is what the deeply forgetful get after then cooperate. In Dotty case, and after the shower, potato chips or a nice ride out in the world. Out in the world where we sometimes went to Walmart and had Dotty drive all over the store in a motorized shopping cart. Dotty never ran into anything. The best part came when she told Joanne how proud she was of her ability to drive the cart. You can use the search box on the right hand side of the page to access our knowledge base of more than 4,600 article. For more information like I wrote about here in this article you could enter any of these words in the search box: bright light, shower, bath, pee, potato chip, ice cream, Walmart, socialization, medication, basically you name it, we have it.